‘Cobwebs’ reunites the TARDIS team of the Fifth Doctor, Nyssa, Tegan, and Turlough for the first full-length and full-cast story since Nyssa’s departure in ‘Terminus.’ With Janet Fielding finally consenting to reprise her role on a regular basis, Big Finish decided against taking the easy way out and inserting several stories between ‘Mawdryn Undead’ and ‘Terminus,’ instead choosing a far more interesting route and having Nyssa rejoin the others fifty years after initially departing. Accordingly, even though the excitement around this story rightly focuses on Tegan’s presence, it’s the story of Nyssa that really becomes the spotlight. Whereas Nyssa oftentimes was relegated more to the background on television, Big Finish has afforded an incredible second lease on life for the character, and that has never been more true that here, having stopped her work with the Lazars some fifteen years ago after developing a successful vaccine for their condition. Now searching for a cure for Rictus that has since claimed some six billion lives, she and her robot companion arrive to explore a cobweb-laden gene-tech facility on Hellheim, facing a tremendous ethical dilemma along the way. Meeting up with her old friends fifty years after leaving- but only two days from their perspective- allows an incredibly rewarding shift in dynamic, allowing Nyssa to be much more forthright with Tegan and to be more of an equal of the Doctor. Peter Davison excels with the larger TARDIS crew reunited as well. It’s odd that arguably the most well-mannered and passive of Doctors had arguably the loudest and brashest companions, but here he deftly handles the varying and heightened emotions, playing off the different personalities wonderfully. Carrying on from the events of ‘Enlightenment,’ the Doctor must handle Tegan’s continuing concerns with Turlough’s Guardian-induced intent, Turlough’s reactions to Tegan’s distrust, and also the much happier return of Nyssa, though he is understandably distraught that Nyssa expresses no desire to rejoin them permanently. For better or for worse, Janet Fielding recaptures the essence of the young Tegan perfectly. While there are certainly moments where Tegan seems determined to be combative and confrontational for no good reason, Fielding also manages to insert a steadfast loyalty and ceaseless honesty to her character and performance that keeps it bearable while capturing the nostalgia for the character effortlessly. With the focus so squarely on Nyssa and Tegan, Turlough understandably has less to do in ‘Cobwebs’ than his peers. Still, Mark Strickson brings his usual enthusiasm to the role as Turlough tries to prove himself to Tegan while trying to find a way not to seem like a useless third wheel. Yet ‘Cobwebs’ is not simply about character interaction, telling a rewarding story in its own right. The discovery that the TARDIS crew arrived forty years earlier simply causes a temporary uneasiness as the fact that the heroes may be responsible for the devastation starts to sink in, especially when four familiar skeletons are found. As they try to prevent their own deaths, the truth behind the skeletons is revealed to be far more devious and complex, and the resulting temporal story of ruthless economics fits the Davison era perfectly and really seems like one perfectly suited for the televised medium. 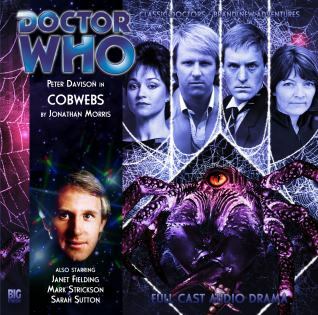 With spectacularly tense and atmospheric direction, ‘Cobwebs’ is a riveting tale that opens up a completely unexplored area of the Fifth Doctor’s life while allowing a tremendous amount of personal development for Nyssa by flashing forward fifty years in her own timeline. The first half of the story does plod along a bit more slowly as the events are more driven by dialogue than by action, but the second half significantly ratchets up the excitement and danger before a satisfying resolution, finishing a solid release on a very strong note.